There are two elements of being a Realtor that I really love: working with people and looking at houses. Neither ever gets old. It’s super dynamic and interesting. I get to look at lots and lots of houses. When a house is “architecturally interesting” it perks me up and I literally feel the excitement and energy of the brilliance of design. The houses of Bob Rummer do this to me. They’ve always been interesting. I truly have loved them from the first time that I laid eyes on one. Today they are experiencing a resurgence of popularity. They share common elements with the modern homes being built today. They feature an open floor plan and well thought out design. Remember these homes were being built in the 1960’s when the common ranch style floor plan was being widely built. The layout is a U shape with the open end of the U facing the street. Typically there is a wall with a front door facing the street. While they do have curb appeal, they are understated. 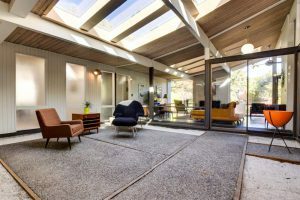 When you go through the entry you find yourself in a central courtyard that is walled with windows, and often sliding doors, that take you into the various elements of the floor plan. One side of the U is the noisy area of the house: the kitchen, the laundry, the garage and utilities. The opposite side of the U is the quiet area: bedrooms and baths. In the middle is a huge open living room with walls of windows that look both out to the back yard and into the courtyard. I recently read that Bob Rummer is still alive. He’s 91 years old and still owns Rummer Homes Inc. He estimates that he’s built about 1000 houses. Rummers are scattered all over the Portland Metro area, including here in Lake Oswego. Most of the houses are about 1800-2000 square feet. 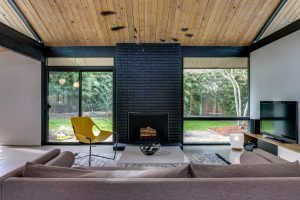 They were built for modern middle-class families and originally sold for about $35,000. Today they fetch far more than that. Several have sold recently. They sell within days. Everyone wants a Rummmer! Recent sales range from $564,000 to close to $800,000. 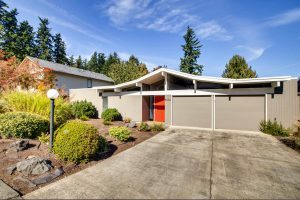 There is currently a Rummer for sale here in Lake Oswego for $699,900. If you’d like more information, please give Linda or myself a call. We’d love to be of help.